A rich, dark vinegar with a lingering smoky sweetness; northern China's knee-jerk accompaniment to dumplings, noodles, soups and braised eggplant dishes. 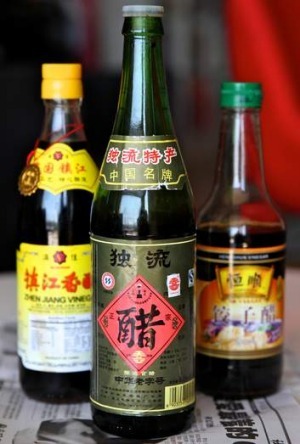 The best is Chinkiang (Zhen Jiang) vinegar from the eastern province of Jiangsu, made from black glutinous rice, water, sugar and salt. Because it's black magic. Just a dash transforms oysters, soups and noodle dishes, cuts through fatty pork and does wonders for salads. Serious addicts carry a small bottle at all times in case they meet a boring dumpling. Certainly. Chinkiang sells for $3 in Asian food shops and will last for years. And, because it's good for the digestion, blood pressure, colds and flu, so will you. At the Potsticker in Caulfield North, black rice vinegar is the natural accompaniment to the pan-fried dumplings. ''It's a very traditional pairing,'' says owner Eric Wong. Chef Dai Duong, of Geoff Lindsay's Dandelion, teams it with smoked eggplant, spring onions and chilli in a slow-cooked claypot. ''It's almost like an Asian balsamic vinegar,'' he says. ''Normal vinegar just wouldn't do it.'' Leigh Power, head chef of Gingerboy, celebrates its ''mellow, malty, woody, smoky'' qualities with his dish of slow-roasted pork belly with spiced black vinegar caramel and heirloom tomato salad. ''It's like a modern play on sweet-and-sour pork,'' he says. ''You get the sharpness coming from the vinegar, the sweetness from the caramel, and the freshness of the tomatoes and herbs on top.'' Power has even used black rice vinegar, palm sugar and vanilla to macerate strawberries for dessert. 1. Bring the black rice vinegar, chilli oil, soy and sugar to the boil, stirring, and simmer until reduced by half. Set aside to cool. 2. Combine the filling ingredients in a bowl, mixing well with your hands until smooth. Refrigerate for one hour. 3. Spread four wonton wrappers on a clean cloth. Place a teaspoon of filling in the centre of each and brush the edges with a finger dipped in water. Fold over to form a triangle, pressing to seal the edges. Make remaining dumplings, in batches. 4. 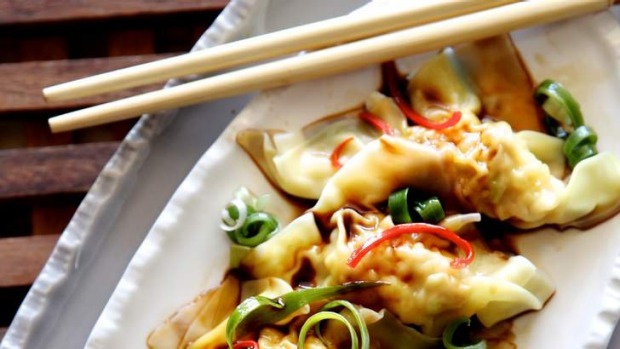 Cook the wontons in a pot of simmering water or stock for three minutes or until cooked. Drain well. Scatter with julienned spring onion and chilli and serve with the black rice vinegar reduction.